Around LA: Neo-Soulstice feat. KATALYST + MORE @ The Breakers – Long Beach [3.10.16] – Be Fearless. Be Flagrant. The Downtown Long Beach Associates Presents LIVE AFTER 5: Neo-Soulstice. 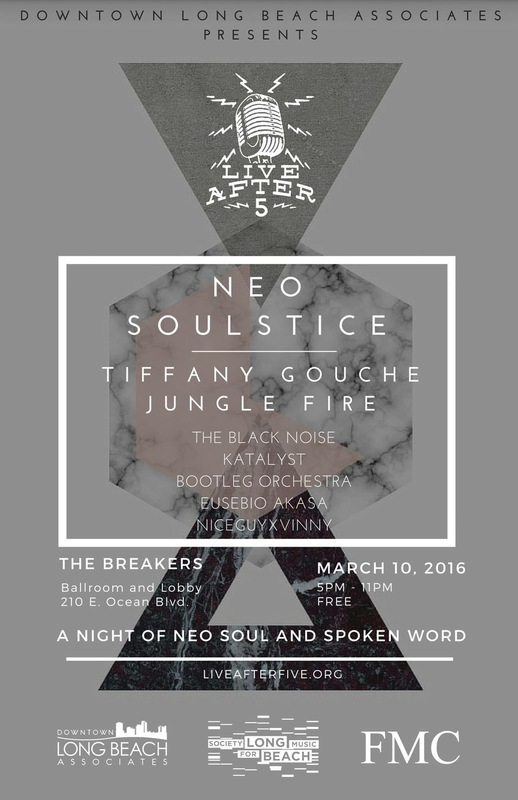 Check out the Kats, alongside many other amazing acts (Tiffany Gouche, Jungle Fire, The Black Noise, Bootleg Orchestra & more) in Long Beach, CA this coming Thursday, March 10th, 2016 at The Breakers Ballroom & Lobby! When: Thursday, March 10th, 2016 from 5 to 11pm! RELATED: AROUND LA: THE VENZELLA JOY – HOLLYWOOD NIGHTS EP RELEASE SHOW RECAP!